Air Conditioning Service Las Vegas: Is Your AC in Need of Replacement? When the heat strikes in Las Vegas, your air conditioner is like your lifeline, and you don’t want to be caught without it. Warning Sign #4. The temperature in your home isn’t consistent. When you set your thermostat to a certain temperature, your air conditioner is designed to keep your home consistently at that temperature all the time and in every room. If you’ve noticed that the temperature in your home doesn’t stay consistent, or that certain rooms are either colder or warmer than other rooms, chances are, there is something wrong with your unit and it needs to be replaced. Warning Sign #5. The indoor air quality in your home is poor. Regardless of if you have changed your filters regularly or not, at some point, an older system will lose its ability to rid the air inside your home of dust, pollen and mold. If you’ve noticed a musty, unpleasant smell, there’s a possibility that there could be mildew or mold growing somewhere in your home. Mycotoxins are found in some molds, and they can make some respiratory problems, such as asthma, much worse. Additionally, if your system no longer dehumidifies the air, it creates an environment where mold can grow and thrive. Warning Sign #6. Your air conditioner is excessively loud. A noisy air conditioner is not only annoying to the entire household, but it could indicate trouble for your unit. When your air conditioning system is operating properly, it should be almost silent. However, if you hear a buzzing, rattling or ticking noise when you are running your unit, the likelihood that there are serious problems with the operational mechanisms in your system is high. Warning Sign #7. Your home just isn’t comfortable. 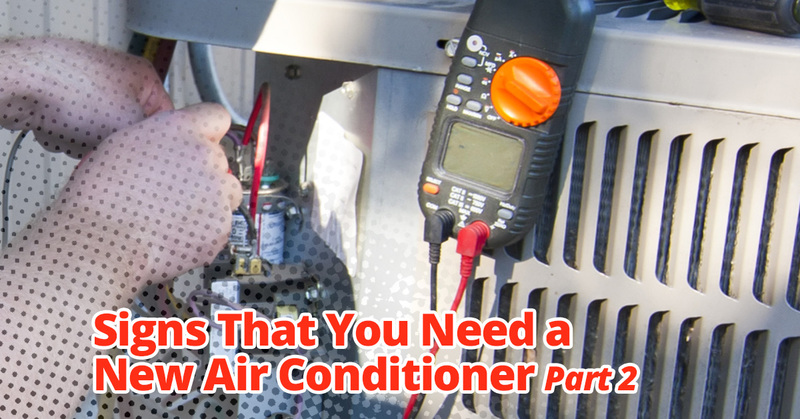 You depend on your air conditioner to keep your home cool and comfortable, and if it isn’t doing that anymore, it’s time to get it replaced. This is often a sign that your air conditioner is either not the right size for your home or it is old and outdated. The heat will be here before we know it, so if you notice any of the signs we’ve gone over, get your air conditioner replaced with Tippetts Mechanical! We are your premier source for air conditioning service in Las Vegas, and we can handle anything from minor repairs to full HVAC system installations. Schedule your appointment with our experts online today!